As the weather gets cooler and we start thinking about getting our barns and homes ready for winter, we generally have our list of things to do for winterizing. For me, winterizing around the barn has meant getting out heated buckets, installing trough heaters, making sure blankets are ready if needed, draining hoses, and various other chores to get the barn and horses ready for winter. But what about our horses’ hoof care, is there something special we should we do during winter? There are many myths and wives tales surrounding hoof care in the winter months so we must first know what is truth versus myth and then consider what issues we might face. Contrary to popular belief, horses do need hoof care in the winter months. 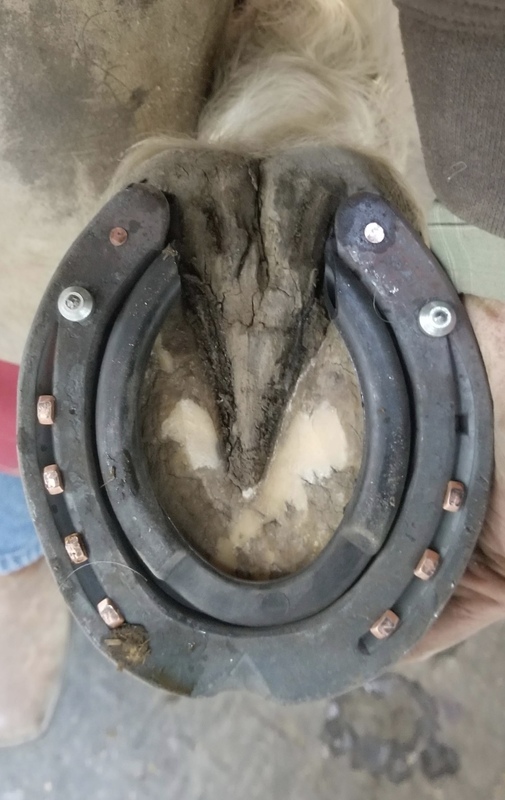 Many believe that hoof growth slows during the winter months, there is some evidence to suggest this is possible but it does not slow to the point of the horse not needing care. With the mix of ice and the hard, frozen ground in the Indiana winter, many horses will still need protection or additional traction. For a horse that is barefoot, continuing to maintain a consistent trimming schedule is all that is really needed. For horses that still need the protection or traction that shoes offer during the winter, there are a few things we can do to make the season safer and easier. If a horse has shoes on, or even some horses that are barefoot, snow packing into their feet and forming ice balls can be a problem. These balls of ice extend beyond the bottom of the foot to make walking difficult and slipping very likely. Each time a horse is brought in, the ice must be picked out of the hoof, which can be difficult and time consuming. In order to combat the this problem, we suggest using a snow pad under the shoe which will keep the snow from building up in the hoof. Traction is the other major concern during the winter. There are several options that we have depending on the type of terrain the horse is working on. Drill-tek, brorium, ice nails, and studs can all be used. We suggest small studs as they provide a good amount of traction on ice but do not hinder the horse’s movement on other terrain and are more forgiving on the horse’s joints than Drill-tek. Before the snow starts to fly, take the time to talk to your farrier about options that are right for your horse during the winter months.